It's true what you heard. The undisputed heavyweight afrofunk album of the decade is coming out of retirement. 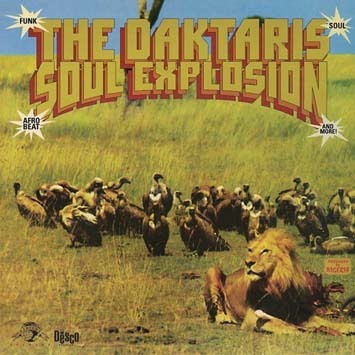 Soon after it's release in the early Desco days, the Daktaris' Soul Explosion became a sought after funk classic and has since become a staple in every serious funk and afro-funk collection. As Peter Franklin of Abidjan Musique says, "The Daktaris is a well-disciplined army of two hundred African Bull Elephants marching relentlessly up your business to the beat from Funky Drummer."